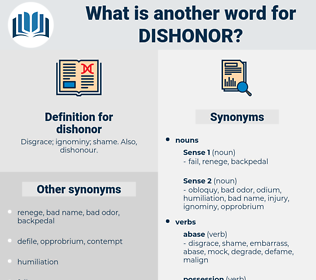 What is another word for dishonor? Disgrace; ignominy; shame. Also, dishonour. go down in someone's opinion. took rug out from under. commendation, compliment, praise, happiness, credit, dignity, approval. appreciation, estimation, esteem, laurels, jewel, aggrandize, fear, admiration, promote, glory, awe, advance, exalt, pride, dignify, respect, boast, reward, raise, treasure, reverence, uplift, renown, regard, repute, elevate. cleanse, clean, purify, upgrade, improve. It asks what can be expected of a President who is as blind to the dishonor of his country as he is to the dishonor of his own home? I cannot tell to my Uncle, the General Robert, that it is that I, a woman of honor, have planned for myself, a man of dishonor, to betray a woman into his hands, and I shall receive from him what that Buzz Clendenning calls to be a 'dressing down. 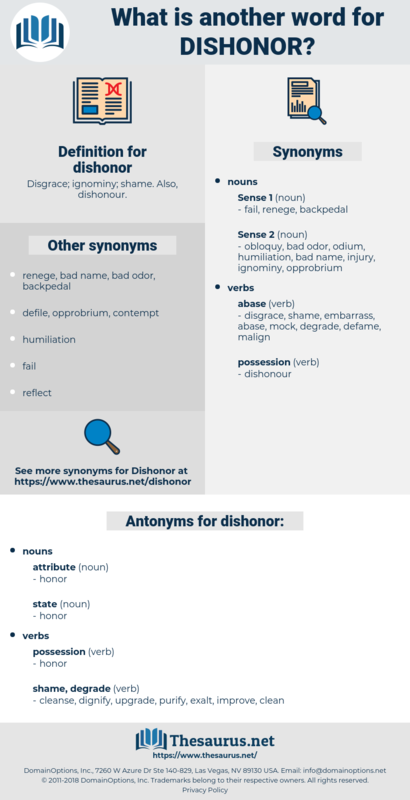 decumaria, decumary, dysmenorrhea, dishonour, dejeuner, designer, decennary. corruptness, shame, opprobrium, disrepute, disesteem, ignominy, infamy, disgrace, discredit. pass up, decline, reject, turn down, refuse.